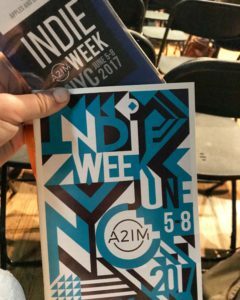 Today, I had the pleasure of attending A2IM’s Indie Week, a conference in New York City which focuses on the global impact of Independent music. The conference runs today through Thursday and culminates at the Playstation Theater with The Libera Awards Thursday night. I must confess, while I love music and generally consider myself fairly knowledgeable about the latest artists to hit iTunes or Spotify, “Independent Music” is a new term for me. My naiveté led me to believe I’d be listening to panels about alternative musicians, perhaps most of whom are just getting their start. I learned quickly from moderator Michael Reinhert, Partner at Fox Rothschild, that in fact some of the largest names in the industry including, Taylor Swift, Mumford & Sons, Jason Aldean, Adele, etc. etc. are all “Independent” musicians. With a greater grasp on what I was about to experience, I took out my iPad and excitedly started taking notes. The first panel was on a topic that holds particular interest for me: “Distribution Agreements in a Digital World.” Having worked in Digital Media for a Broadway show for two years, I know first-hand just how much the digital landscape has changed the arts industry (and so many others). I was intrigued as to how digital accessibility has impacted business in this segment of the arts world. There are quite a few examples of famous artists who found their way to the top through self-promotion on social media. In a day and age when you can easily post a video of yourself singing on YouTube and potentially end up as the next Justin Bieber, how important is it to seek label and marketing representation? Are there benefits to being an unsigned commodity, being your own advocate? Are there disadvantages? What are they? Luckily this was exactly where the panelists started their conversation. The first question that moderator Tim Mandelbaum, Partner at Fox Rothschild, posed to the panelists was: “How do you respond to whether labels and artists need traditional distribution agreements anymore?” The answer was a resounding “they absolutely do”; however, they must be updated to accommodate the ever-changing landscape. Agreements between labels and distributors used to be fairly straight-forward: the agreements were stock contracts that said the distributors would get records into the market place and the fees that resulted would be a function of what kind of sales the artist was driving. Now, because digital distribution is so different, these agreements have to be written from scratch every few months to keep up with the rapid rate of change. Since I lived through the transition from cassette tapes to CDs to iTunes to digital streaming, I found the topics of discussion today fascinating. I went to a small college that had a very strict Honor Code. One day during my Freshman year, a few students I knew received emails from a Dean asking them to come in to discuss a violation. The violation was having pirated music on their school computers. To think back to the precipice of online music content at the time and how the industry had not yet found a way to offer digital music with artist’s consent (and proper compensation) to today’s streaming environment that was shaped around solving the very problem we were facing not so long ago is a pretty phenomenal example of how accessibility to content has changed the ecosystem. As record sales continue to dwindle, and streaming services continue to grow and evolve, the music industry is facing a new and exciting era. From everything I’ve heard at Indie Week today, they’re geared up and ready to go. Keep up with all our coverage of events, news, and information about Taking the Starving Out of Artist by following us on Twitter or Facebook or signing up for our newsletter below!